I came across the following video, which is a presentation, by Robert Full , on how engineers or future engineers like you can learn from animals to build robotic structures. Hello and Welcome to English 123 of this 2008 Summer Session! 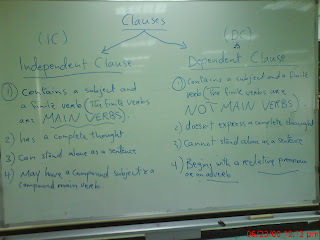 This is our class blog where I'll be posting information and links that should help you improve your grammar and writing skills. The information might include links to useful websites, audio/podcasts, and videos that are all relevant to the syllabus of this course. You are welcome to post comments or questions on anything I publish on this blog. I will distribute handouts in class soon with more stuff and URLs of our Google Group and Flickr Group with directions for all of you. I am sorry that we still don't have a computer-lab in our English Language Unit of Engineering yet, but I'd be more than happy to show you or assist you with anything needed through my PC in my office. I wish you all a happy and successful Summer Session. Noura has asked me to provide her with links to websites with articles to read in order to improve her reading skills. Well, as I mentioned in class try to read everything and anything you see in English whether on the Net, or in newspapers, on TV, or even advertisements you see on buses on your way to school or back to your homes. Grammar Games by the British Council! Please note, you need to read the instructions or directions provided to you in order to understand what you need to do. 2) An antibiotic is a drug that cures bacterial diseases. 3) A lung is an organ for breathing. 4) Acoustics is the science of sound. 5) Photosynthesis is the process by which plants manufacture food. 6) A catalyst is a substance that speeds up but is not changed by a chemical reaction. 7) A calorie is a unit that measures heat. OR A calorie is a unit for measuring heat. 8) A cyclotron is an apparatus that bombards the nuclei of atoms.